NASA astronauts were transported by dinghy to the Orion space capsule in the Gulf of Mexico, where they boarded the spacecraft to test out exit procedures. If NASA wants to safely send astronauts on missions into deep space in the new Orion space capsule, the space agency must first tackle some critical safety tests while its astronauts bob around in the open ocean. Last week NASA and the U.S. Coast Guard cruised out into the Gulf of Mexico near Galveston, Texas, to test out the exit procedures for crews returning from space in the Orion capsule. An astronaut exits the Orion space capsule in the Gulf of Mexico during an emergency-egress test on July 11, 2017. The orange raft to the left is their lifeboat. Today's astronauts return from the International Space Station by parachuting down to Earth in one of Russia's Soyuz space capsules and touching down on land somewhere in Kazakhstan. But the Orion spacecraft is designed to splash down into the Pacific Ocean. If something were to go wrong during Orion's return to Earth – a fire or a leak, for example – the crew would need to be able to climb out of the capsule and get to safety without the help of a recovery team. This would involve opening the top hatch, hopping into the water and inflating a bright-orange raft. 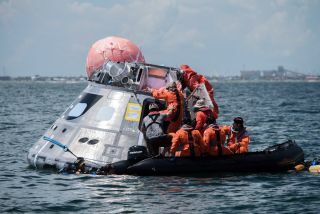 A U.S. Coast Guard vessel named Harry Claiborne (WLM-561) transported the Orion space capsule to and from the testing site off the coast of Galveston, Texas, in the Gulf of Mexico. Escaping the capsule without any help would not be easy. After spending an extended period of time in an environment without gravity, the human body gets weaker. Bone and muscle mass deteriorates in space, which is why astronauts who return from the space station are often placed in wheelchairs after recovery crews help them out of the hatch. "Astronauts returning to Earth in Orion will have spent many days in space, and we want to make sure the last part of their journey goes smoothly no matter what kind of conditions they land in," Tom Walker, the rescue and recovery lead for Orion at NASA's Johnson Space Center in Houston, said in a statement. "Our testing in the Gulf of Mexico gives us an opportunity to practice and evaluate our plans and hardware for how to get crew out of Orion as safely and efficiently as possible." The crew module uprighting system on the Orion spacecraft uses five airbags on top of the capsule to help turn the capsule right side up in case it gets knocked over during a rough landing. These airbags have been tested at the Neutral Buoyancy Lab at NASA's Johnson Space Center in Houston. To account for all of the possible outcomes of Orion's splashdown, NASA has come up with several different exit procedures. This approach "gives recovery personnel and mission controllers flexibility to account for the crew’s health, weather and the condition of the recovery personnel and equipment in the area in real-time," NASA officials said. Orion is currently scheduled to launch on its first crewed mission between 2021 and 2023. It will lift off atop NASA's brand-new Space Launch System (SLS) rocket and will venture to the moon, Mars, asteroids and beyond.